Russian Eurobonds demonstrated strong gains amid sell-off in US stock market that recorded its worst monthly performance in December since the 1930s. During the recent market turmoil since October, most investors preferred to keep the funds in US cash, in terms of risk aversion we seen good flow in highly reliable Russian Eurobonds (for example, VEB's debt), or pursue specific trade ideas in LATAM (Brazil and Petrobras). 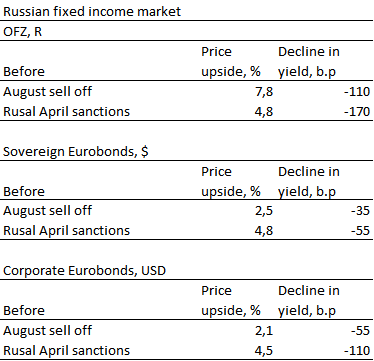 VEB’s long-term bonds issues are becoming attractive in near term due to recent ease in tensions over Rusal, postponement of Russian sanctions and recent allocation of R300bln of approved subscribed capital by the government.